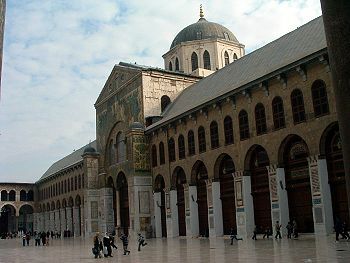 The Courtyard of the Umayyad Mosque in Damascus, one of the grandest architectural legacies of the Umayyads. The Umayyad Dynasty (Arabic بنو أمية banū umayya / الأمويون al-umawiyyūn ; Persian امویان (Omaviyân), Turkish, Emevi) was the first dynasty of caliphs of the Prophet Muhammad who were not closely related to Muhammad himself, though they were of the same Meccan tribe, the Quraysh. The first dynasty reigned from 661 to 750 C.E. Ironically, the Qurayshi clan from which the Umayyads originated had initially been bitter enemies of Muhammad. They greatly expanded the size of the caliphate and established sound administrative practices, although tended to favor Arabs over non-Arabs. They were criticized for ruling the caliphate as if they were kings, not leaders of a religious community with authority as a divine trust. They lost power to the Abbasids in 750 C.E., who promised to govern according to the edicts of Islam, but a survivor established a sultanate (later declared a caliphate) in Andalusia, where they presided over a flourishing civilization. At a critical time in the development of Islam, the Umayyads at Damascus ensured the new faiths survival while their later rule in Spain remains an outstanding example of Muslims living in positive exchange with Christians and Jews and of an intellectual flowering that remains of significance today. Generally, the early Umayyad dynasty is regarded as a less than ideal period of Islamic history, when the struggle between faith and temporal power saw the former dominate at the expense of the latter. MuawiyahI had been the governor of Syria under the 3rd caliph and his kinsman, Uthman ibn Affan. After the assassination of Uthman, he was replaced by the new caliph, Ali ibn Abi Talib. Since the killers of Uthman had allied themselves with Ali, Muawiyah refused to accept his caliphate, and in 657 led an army against him. The two sides agreed to a conciliation procedure, resulting in an arbitration that many of Ali's partisans saw as unfair, and the Muslim empire was partitioned. When Ali was assassinated in 661, his son Hasan pledged allegiance to Muawiyah (disputed by Sh'a) and Muawiyah was declared caliph of all Muslim lands. This established the Umayyad dynasty, and the capital of the caliphate was moved to Damascus. Great waves of expansion occurred under the reign of the Umayyads. Muslim armies pushed across North Africa and Iran through the late 600s, expanding the borders of the empire from the Iberian Peninsula in the west and to India in the east. Under Sulayman (715 - 717) son of Abd al-Malik, forces led by Tariq ibn-Ziyad crossed Gibraltar and established Muslim power in the Iberian Peninsula while other armies established power far away in Sind, on the Indian subcontinent. Hisham's long reign (724 - 743) saw the empire reach the limits of its expansion. The Muslim empire under the Umayyads was now a vast domain that ruled a diverse array of peoples. However, in 740 the Shi'a Imam, Zayd b Ali (Hussain's grandson) led a rebellion that resulted in a Shi'a state in Northern Iran (Tabaristan) between 864 and 928, and also in the Zaydi state in the Yemen (established 893). The second Umayyad ruler, Yazid I is especially vilified by Shi’a for the murder at the Battle of Karbala (October 10, 680) of Husayn (or Husain), the prophet’s grandson who claimed leadership of the community. The Umayyads were overthrown in the east by the Abbasid dynasty after their defeat in the Battle of the Zab in 750. Following the battle, the Abbasids massacred most of the clan. In 749 Abu al-Abbas al-Saffah was proclaimed the first Abbasid caliph. An Umayyad prince, Abd-ar-Rahman I, took over the Muslim territory in Al-Andalus (Hispania) and founded a new Umayyad dynasty there. From 929 they claimed the title of caliph, thus challenging the legitimacy of the Abbasids. The Umayyads, it is generally argued, ruled their territory as if it were their personal possession and paid only lip service to Islam. Their story, however, is largely told through the eyes of their successors—the Abbasids—and reflects the view that they were worldly rulers, yet they left behind two of the most significant Islamic monuments, the Dome of the Rock (Qubbat As-Sakrah) and the Umayyad Mosque in Damascus. They built ornate palaces, which their predecessors had not, living a more humble life-style. The Qur’anic inscriptions on the Dome are the oldest in existence. According to the secular historians Michael Cook and Patricia Crone (1977), the Qur’an itself dates from the same period, while Islam is a back-projection from the time of Abd-al-Malik (685 - 705), who more or less created it (29). Muawiyah and Yazid, certainly, were worldly rulers but there is some evidence that al-Malik took Islam more seriously and may have intended the Dome (built between 687 and 691) to accommodate the hajj while the rival caliphate under Ibn al-Zubayr held Mecca (680-692). The beautiful calligraphic citation from the Qur’an celebrates Islam’s triumph over the earlier monotheistic religions, Judaism and Islam. The Umayyads improved upon the past treatment of the non-Muslims. They did not only guarantee them religious freedom and protection of civil rights but also appointed them to some of the highest places in government. In many respects, they were more trusted than the Muslims. Key departments such as finance, taxation, commerce and trade were usually manned by Jews or Christians (73). Umar II “reversed the process and dismissed many Christians and Jews,” citing Q5: 21 (“don’t take them [peoples of the book] as your friends”) but “his successors reverted to the old practice.” It was not until as late as the middle of the ninth century that Muslims formed the majority of the population in the Middle East heartland of the caliphate. The Abbasids may have attracted support for their coup because they promised to restore the non-hereditary caliphate; using shura (consultation) to select successors but they in fact also established a dynasty. Like the Umayyads, they also used the title ‘deputy of God,’ omitting ‘of the prophet of God,’ thus claiming a direct line of communication with God. It was the religious professionals who codified the Shar’iah and the traditions (sunned) of the Prophet and who claimed that they, not the caliph, possessed the right to interpret the Qumran which effectively resulted in a separation of roles, fish (law) became the province of the lama (religious scholars often financially independent of the State by means of religious endowments) and siyasa (politics), the realm of the temporal ruler. In the Umayyads favor, too, is the fact that throughout their caliphate, its borders were commensurate with those of the Muslim community, which was not true for the Abbasids. The Abbasids initially attracted Shi’a support for the revolt since they could use their kinship with Muhammad (via his uncle) to challenge the Umayyad’s lack of any close family tie. Indeed they were descendants of Abu Sufyan, Muhammad’s long-standing foe, and were also known as the Sufyanids. This early effort at Shi’a-Sunni reconciliation was short lived. Interior of the Great Mosque in Córdoba. Built on the site of a Christian basilica, it has served as a cathedral since the Christian re-conquest. The mosque is one of the finest examples of Umayyad architecture. The first caliph extended his territory towards the Fatimids, controlling Fez and Mauritania in North Africa. The last caliph resigned in 1031. The caliphate then split into numerous taifa (small emirates, about 43 in all). The Almoravids, invited by the emirs (see below) from Morocco to help in the war against the Christian Reconquistadores, took control of Cordoba in 1082, although Cordoba eventually fell to the Christians in 1236. From 1085, Toledo took over the role of center of learning, also attracting students from Europe. The Umayyad’s sultanate (756 - 929) and later caliphate of Cordoba (929 - 1031) in Andalusia (modern Spain) rivaled the Abbasids at a time when the Fatimids also challenged their supremacy, and provides an example of an Islamic society where scholarship (which was already patronized by the early Damascus based Umayyads) and inter-community exchange flourished. Pragmatically, fair treatment of non-Muslims (Christians and Jews were known as the Mozarabes) made sense in a context where Muslims were a minority. 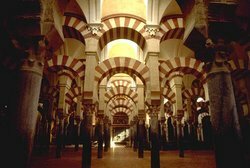 Nonetheless, the Islamic civilization over which the Umayyads of Cordoba (and some of their successors) presided was one that valued synthesis. The Arab and Moor (North Africans) Muslims there continued to develop as well as to preserve the Greek heritage they had acquired in Syria. Cordoba’s main library, established by Hakim II (796 - 822), housed 600,000 manuscripts and served as an embryonic university, attracting Christian students from Europe (Britain, France, Italy, Germany) as well as from the Muslim world. Altogether, there were 70 libraries, and the city boasted seven hundred mosques and three hundred public baths; it was elegantly designed and spotlessly maintained. Houses (113,000 of them) had central courtyards with gardens and fountains and hot-air ducts for the winter. Many of the leading scholars acquired Latin names, as their seminal works were rendered into Latin becoming standard texts throughout Europe. For example, Al-Bakri (after whom a moon crater has been named) (1014–1094) was a renowned geographer and historian. al Zahrawin (Albucasis) (936–1013) was court physician to Hakim II, whose 30 volume medical text, al-Tasrif, was translated into Latin as Concessio ei data qui componere haud valet. Al-Zarqali (1028–1087) (Arzachel) was an astronomer whose “Toledo Tables” were translated by Gerald of Cremona (1114–1187) and whom Copernicus cited four hundred years later. Many stars still have Arabic names. A commonly used term such as "Nadir" is from an Arabic word, nazir, meaning the point of heavens directly under an observer. The political theorist, ibn Tufail (1105–1185) edited Ibn Sina’s classic Hayy ibn Yaqzan ("Alive, Son of Awake") and introduced Ibn Rushd to the court, where he was secretary. Ibn Hazm (994 - 1064) served as vizier to two caliphs, ‘Abd al-Rahman III and ‘Abd al-Rahman V al-Mustazhir, systematized the Zahir school of law (literalist) and wrote the Fisal (detailed examination) in which he analyzed numerous philosophical traditions, including Christian. Ibn Firnas invented the eyeglass, Ibn Bitruji (d. 1204) (Alpetragius) the theory of stellar movement. Several of the above lived after the demise of the Umayyads but continued to work due to the flourishing academic environment that they had created. Without this climate, the first Latin translation of the Qur'an in 1133 by the Englishman Robert Ketton, commissioned by Peter the Venerable (1092–1156), would not have been possible. Perhaps the greatest scholar to emerge was Ibn Rushd (Averroes), whose work influenced Thomas Aquinas (1225–1274). Franciscan Roger Bacon (1214–1292), an expert on Aristotle, was familiar with the work of many Muslim authors and, as did others at the time, regarded knowledge of Arabic as an indispensable part of the tool-kit of any serious scholar. Aristotle was lost to Europe until he was re-introduced in the twelfth century by the Muslims and Jews of Spain. An earlier Christian thinker such as Augustine of Hippo (354–430) knew Plato but was unfamiliar with Aristotle. Like the earlier Ibn Sina, he is credited with synthesizing faith (revelation) and reason, positing two sources of knowledge and two realms of truth. Their critics (including al-Ghazali) say that they substituted Plato for the Qur'an. Christians and Jews also participated in this scholarship and the period 900 to 1200 in Spain is known as the "Hebrew Golden Age." This produced the great Maimonides (1135-1204), although he had to flee to Egypt in 1165. The Almoravid successors to the Umayyads supported a different interpretation of Islam, one which believed that the peoples of the book should be humbled and severely dealt with (Q29 refers to dhimmis, paying the poll-tax until they are humiliated). Europe also benefited from Arab music via Spain—the Lute (from Arabic: al'ud) found its way into Europe through Spain and influenced the development of the classical guitar (Arabic: qitar). The … aql-based Islamic philosophy [reason-based] is a lasting indication of a Western-Islamic encounter in its best terms. I continue [says this writer, a Syrian born German Muslim scholar] to argue that this encounter is still topical (Tibi 2001: 204). This page was last modified on 6 January 2016, at 16:47.